Description: Young schoolgirl Meimi Haneoka moonlights (literally) as the mysterious thief Saint Tail, wearing a ponytail, a very cute magician's costume including a jacket with tails (hence the name) and a top hat, but no mask. Saint Tail steals only from thieves and swindlers, and only to return goods to their rightful owners. Although her good motives are clear, she is pursued by the somewhat inept police detective Asuka and his less inept young son, Asuka Junior, who just happens to be Meimi's school classmate. Saint Tail's only confidant is the young Catholic nun, Sister Seira. This is a cute, fun, comical series, with good (for TV)production values, highly recommended. 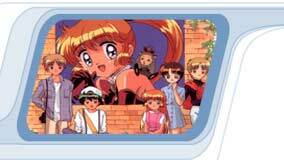 It uses the "good thief/trickster" motif together with many elements from the "magical girl" genre. The main character is not literally magical, however; her magic is prestidigitation and illusion. The elements for enjoyable, slapstick comedy, with not-too-dangerous suspense and tension, are all here and put to good use.